Dalal street is losing its exceptionalism to Shanghai. Historically one of the hottest stock market in the emerging world with market cap to GDP ratio matching that of the developed markets; India has now passed on the baton to China. For the first time in recent memory, Chinese GDP now gets higher valuation on the bourses than India. The combined market cap of listed companies in China is now equivalent to 80 per cent of the country’s latest annual GDP (on current prices) against India’s 76 per cent. In the past India has been ahead of China with historical average (since March 2004) market capitalistaion to GDP ratio of 73 per cent higher than China’s 45 per cent. The 3,000 odd companies actively listed and traded on the Bombay Stock Exchange are collectively valued at around $1,580 billions against country’s nominal GDP of $2,072 billion in FY15 at current rupee-dollar exchange rate. In comparison, 1100 odd companies listed and traded on Shanghai Stock Exchange are now valued at $8,067 billion against country’s nominal GDP of around $10 trillion in FY15. India however continues to lead rest of the emerging market peers such as Brazil, Russia and Turkey on market cap to GDP ratio. South Africa is the only exception with ratio of more than 100% thanks to the listing of global majors such as BHP Billiton and British American Tobacco. In contrast, other markets mostly houses local companies. Historically India’s market cap to GDP ratio is comparable to developed markets such as France, South Korea, Japan and below US and UK. The rise of China is largely to a sharp rally in Chinese stocks. Shanghai market is up 150 per cent since March 2014 against 27 per cent rise in the market cap of BSE listed companies during the period. A typical Chinese company is now 1f times bigger than its Indian counterpart in terms of market capitalisation. A typical company on the Shanghai Stock Exchange is valued at $7 billion (Rs 45,000 crore) on average against average valuation of $500 million (Rs 3300 crore) on Dalal Street. The analysis is based on the latest and the year-end market cap and nominal GDP (in US dollar) of the world’s top developed and emerging markets. The figure excludes the stock markets in Hongkong and Singapore as many of the companies listed in these bourses have operations elsewhere in the region and their valuation doesn’t reflect the local economy. Some analysts sense a bubble in the Chinese market. “There is a bubble like situation in the Chinese market with a sharp rally in even financially stretched firms such as steel producers, who face a global downturn in demand and profitability. Besides, all projections point towards a growth slowdown in China which is negative for local stocks,” says G Chokkalingam, founder & CEO Equinomics Research & Advisory. If there is a bubble, its not visible in the valuation ratios of the Shanghai market though. 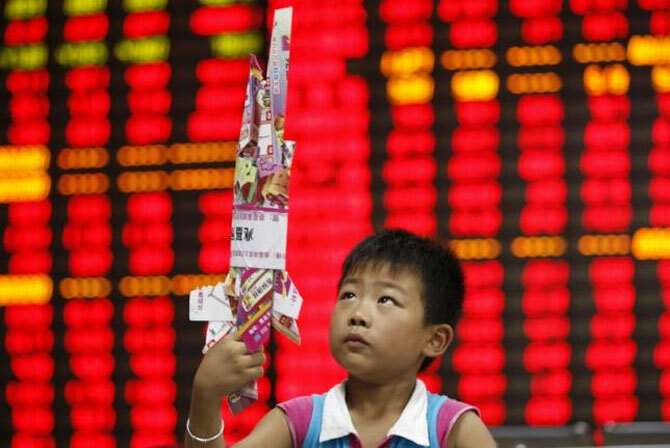 China’s benchmark Shanghai SEE composite is now valued at 21.6 times its trailing earnings similar to BSE Sensex. What has changed is that there has been a sharp re-rating of stock valuations in the mainland. Till a year back, Shanghai market was trading at nearly 50% discount to the valuations on Dalal Street. For three years ending September 2014, Shanghai SEE composite was trading at price to earnings multiple 10-12x against Sensex PE multiple of 18-19x. Thanks to the rally China has overtaken Japan and United Kingdom to emerge as the world's second largest stock market behind United States, in line with its relative position on GDP league table. In comparison, India is now has the seventh largest stock market behind France and Germany but ahead of South Korea and Brazil.